After many trips overseas, it never occurred to me until one of our included tours included a stop at a jewelry shop in the Piazza where I purchased a gold Nefertiti charm. I've loved collecting gold bracelet charms as travel mementos ever since. Now before I even leave my home, I've learned to research, locate and contact jewelry stores before I even leave my house and get on the plane. Today's "Throwback Thursday" brought memories of a wonderful, ten day, escorted Trafalgar Tour trip with my two daughters that began in London and traveled, by motor coach across country to Rome, Italy, August 2008. St. Peter's Basilica in the Vatican was one of the included stops as part of the travel package. 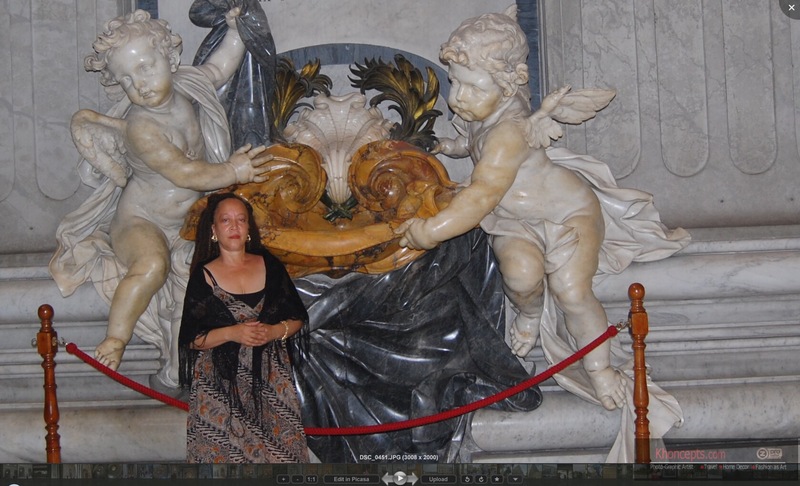 Angels have been with me all my life so it was especially thrilling to have spotted and posed with these two very beautiful marble angelic statutes.